Recapture 360 Anti Aging Cream Review: Is It The Best Choice For You? This review of Christie Brinkley Recapture 360 + IR Defense Anti-Aging Day Cream will provide you with information on this daily cream that you need to determine whether or not it can really provide you with the younger, smoother looking skin you’ve been hoping for. Christie Brinkley is well known for her flawless skin, so it’s no question that we’d be interested in her line of skincare products. Christie Brinkley Recapture 360 + IR Defense Anti-Aging Day Cream claims that it can protect the skin against the sun’s harmful rays and even reverse the appearance of fine lines, wrinkles, and dark spots. For best results, apply an even layer of Christie Brinkley Recapture 360 + IR Defense Anti-Aging Day Cream to your cleansed skin each day, during your morning skincare routine. 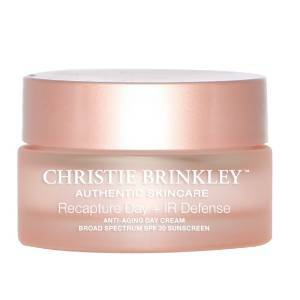 Christie Brinkley Recapture 360 + IR Defense Anti-Aging Day Cream retails for $89.95 per 1.0 fl. oz. of product on Christie Brinkley’s own website. Neodermyl: This ingredient is intended to improve the skin’s firmness and elasticity. Elix-IR: This ingredient helps prevent photo-aging. This day cream targets common signs of aging such as fine lines, wrinkles, and dark spots. This moisturizer protects the skin against damage caused by the sun’s harmful UVA/UVB rays. This product hydrates the skin as it addresses common signs of aging. This skincare treatment is quite pricey, particularly for anyone on a budget. This moisturizer contains fragrant ingredients, including cinnamon bark, which may cause adverse reactions on the skin. This product contains several chemical sunscreens, which may be quite irritating for those with sensitive skin. Christie Brinkley Recapture 360 + IR Defense Anti-Aging Day Cream claims that it can protect the skin against damage caused by the sun’s harmful rays as it diminishes the appearance of fine lines, wrinkles, dark spots, and other signs of aging. Although we’d all love to have skin like Christie Brinkley’s by the time we’re 60, there are several issues with this product in particular that we’d like to address. The first issue we have with this day cream is the price. Spending over $80.00 for a day cream is quite unreasonable for most people on a budget, especially considering the fact that this product is not suitable for nighttime use. This means you’ll be spending money on an entirely different product for overnight use. Secondly, there are some notable irritants in this formula that may not be suitable for those with sensitive skin. There are several fragrant ingredients, including cinnamon bark, and several chemical sunscreens that may not sit well on certain skin types. We’d recommend continuing your search for a day cream that suits your budget and your skincare needs. Christie Brinkley Recapture 360 + IR Defense Anti-Aging Day Cream is sold on Christie Brinkley’s own website. The return policy is quite reasonable. If, for any reason, you’re unhappy with the product you’ve bought, simply return it within 30 days for a full refund. This site will even accept completely empty containers. Customers are responsible for return postage.